Lots going on this week at the Cleveland Correctional Facility … including the launch of Class 20 of the Prison Entrepreneurship Program! Today, we host our Internal Kickoff event. Most of the nearly 110 men who are entering PEP have been connected to us for months, including our three-month “Prep Class” called Principles of Effective Leadership. Today’s event is a celebration of their entrance to PEP with our staff and graduates from past classes. 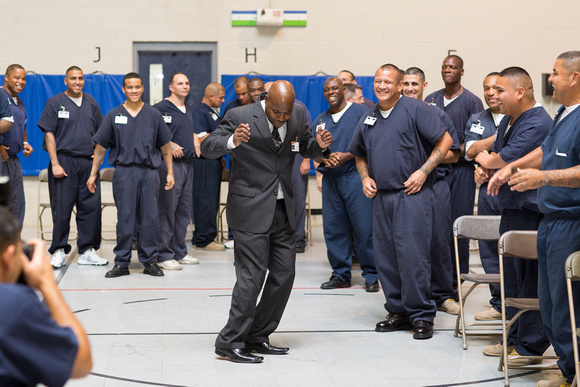 The event that is decidedly NOT like the typical prison experience, as the room is decorated for a party and the atmosphere is one of fun, fellowship and hope! This week also marks the two-week countdown towards our fundraising campaign. As we announced a month ago, we received a challenge grant of $100,000 that will match EVERY DOLLAR that you donate between now and our July 19, 2013 kickoff. Your gift of $100 will instantly become $200 through this campaign. Together, we can transform prison!